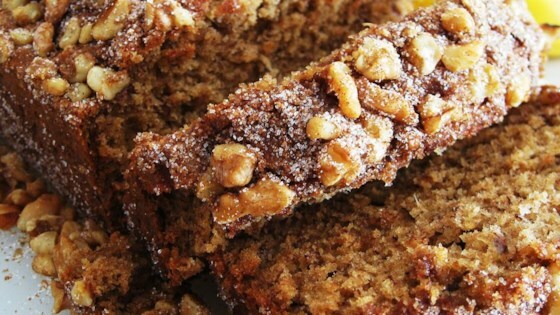 "This is a different banana bread, sweetened with maple syrup. It's my absolute favorite banana bread. I'm sure you will love it this version." In a large bowl, mix the melted butter and maple syrup. Beat in the egg and bananas, leaving a few small chunks. Stir in the maple extract and milk. In a separate bowl, mix the flour, baking soda, and baking powder, and stir into the banana mixture just until moistened. Transfer to the prepared loaf pan. Mix the nuts and sugar, and sprinkle evenly over the batter. Bake 50 minutes in the preheated oven, or until a knife inserted in the center of the loaf comes out clean. I tried this recipe for a different spin on the banana bread I usually bake. What a disappointment! This bread was dry and tasteless. I'll gladly go back to my original banana bread! Very tasty and moist! I also substituted vanilla for maple extract and lessened the baking soda. I was very pleased.